Madigan’s Waterfront is a locally owned and operated seafood and steak restaurant serving Woodbridge, Fairfax Station, Fairfax, Lorton, Montclair, Aquia Harbour, Alexandria, Springfield, Oakton, Vienna, Reston, Herndon, Dulles, Centreville, Chantilly, Manassas and Prince William, Stafford, Arlington, and Loudoun Counties and the Northern Virginia region. At Madigan’s Waterfront every dining experience is special and unique. Dine by candlelight or the shimmering stars in season. While we offer formal dining at our waterfront restaurant, our guests can also kick back for some casual waterfront dining on our TOPSIDE DECK. Also visit our TOPSIDE TIKI BAR in the summer months. A full menu is available on the TOPSIDE DECK. 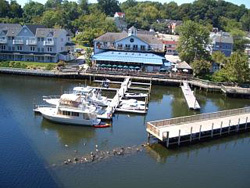 The expansive partially covered OUTSIDE DECK and TIKI BAR is especially attractive on summer evenings, where you can enjoy drinks and food served in season, and watch for Ospreys flying down the Occoquan River. Our staff can set up great seatings for all occasions. Life affords precious few opportunities for momentous celebrations. So when those Events, Weddings, and Special Occasions do arise, you want to make certain everything is just right. Let Madigan’s Waterfront host your next Special Occasion and go to the Banquets and Special Events Page to review our offerings. Madigan’s Waterfront has the facilities, accommodations, and staff with twenty years of experience and knowledge to provide you with everything required for your Event or Special Occasion. Cathy, with her years of experience, can help with your preparations and insure a successful event. Reservations for the dining room are taken for parties of six or more, unless it is a holiday such as New Years, Valentines Day, Easter, Mother's Day, etc. when reservations are required. Starting in season we have Monday Deck Parties. On weekends, enjoy acoustical deck acts. Make sure you check out our Photo Gallery Page to observe many of our food and dessert selections and pictures of the restaurant.